Born in 1899, Amatuna began his career as a messenger for the Genna brothers. He progressed to become an enforcer and later bodyguard for “Bloody Angelo” Genna in 1920. He would beat up anyone who even criticized the brothers and was handy with both knives and guns. The Gennas ran the 19th Ward in Chicago — known as the Bloody 19th — and Amatuna ensured that everyone voted the way that the Gennas wanted. John Powers had served the ward since 1888 but the Irish population had diminished, to be replaced by Sicilians and Italians. They put up Anthony D’Andrea as a candidate against Powers but the Irishman had been a devoted public servant and it was not just the Irish who wanted him to stay. Frank Lombardi was an enthusiastic supporter of Powers but in February 1916, while he was drinking in a bar on Taylor Street, the 17-year-old Amatuna gunned him down. Powers won the election but four years later, on 28 September 1920, Amatuna bombed the alderman’s front porch. 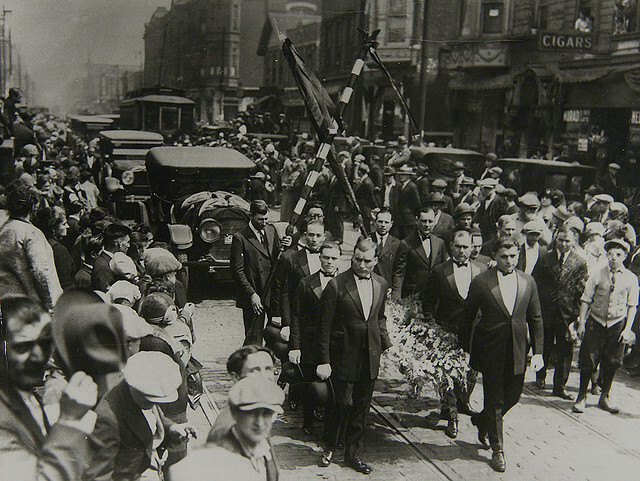 Powers was not deterred and surrounded himself with armed guards who accompanied him on the 1921 campaign trail. More bombs were set off in front of homes of both candidates and supporters. Powers won the election by 435 votes but Angelo Genna, Amatuna and Frank Gambino murdered Paul Labriola, a Powers supporter and court bailiff, on 9 March 1921. Amatuna also shot dead two more aides of Powers’. Amatuna grew rich through his association with the Gennas and bought the Bluebird Café on Halstead Street. He never carried his guns inside and would entertain patrons nightly with his tenor voice. After the murder of Angelo Genna on 25 May 1925, Amatuna took over the presidency of the Unione Sicilian. On 13 November 1925, in preparation for a visit to see Aida with his girlfriend Rose Pecorara, Amatuna visited a barbers owned by Isadore Paul on Roosevelt Road, for a shave and a manicure. As a hot towel was placed over his face, Vincent “The Schemer” Drucci and Jim Doherty entered the shop and began firing, hitting Amatuna in the chest. Amatuna was taken to Jefferson Park Hospital where his last request was to be married to Rose. A priest was summoned and the ceremony began but, before Amatuna could say “I do”, he slipped into unconsciousness. He died a short time after. He was just 26. Samoots was my 2nd great uncle. How did you find this picture?